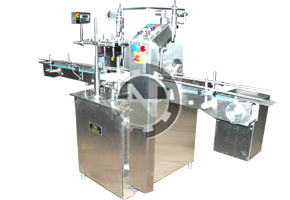 NKLFL-100, automatic four head volumetric liquid filling machine is a compact model used for filling of plastic and glass containers. A Imported, fiber optic sensor senses the Bottle and then give the order to syringe system to fill the bottle as per required dosing. Then it is conveyed to the downstream machine for subsequent operation.